U.S. Speedskater Admits To Sabotaging Rival's Skates Simon Cho says he tampered with another racer's skates at the World Short Track Team Championships last year after being pressured by his coach. The coach, Jae Su Chun, denies the claims. Simon Cho (center) celebrates after beating China's Liang Wenhao and Liu Xianwei and Canada's Olivier Jean (right) in the men's 500-meter final at the 2011 World Short Track Speed Skating Championships in England. Cho, 20, won a bronze medal in the 2010 Vancouver Olympics and is the reigning world and national champion in the 500-meter short track event. He was considered a good prospect for the 2014 Olympics in Sochi, Russia, but the tampering incident clouds his future. "Simon was directed to do what he did by his coach," says John Wunderli, his Salt Lake City attorney. "He had nothing personally to gain by doing it and gained nothing personally from doing it," Wunderli adds, as he argues for leniency for Cho. "And [he's] now being completely honest and taking responsibility for doing it. I think those three points have to be taken into consideration." 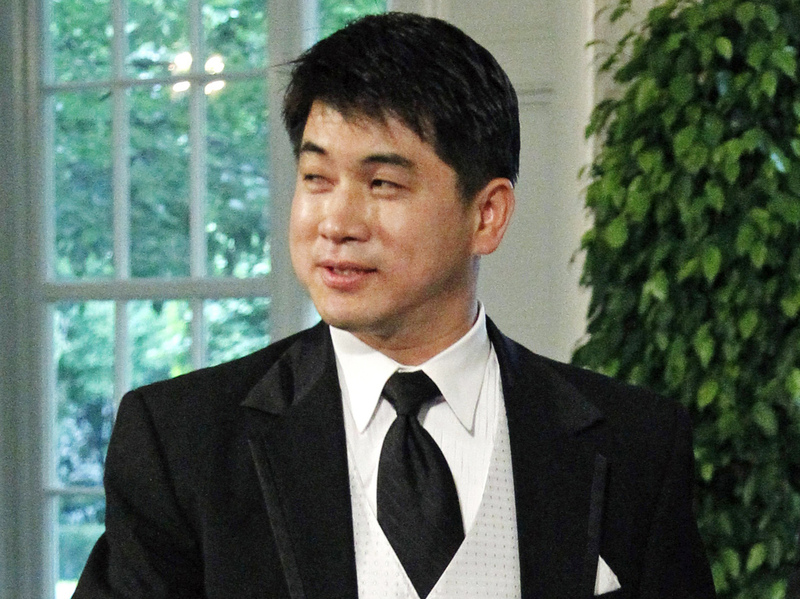 Olympic speedskating coach Jae Su Chun arrives for a State Dinner at the White House in May 2010. Chun is accused of verbally, physically and psychologically abusing various members of the U.S. short track team. Cho claims that Jae Su Chun, the head coach of U.S. Speedskating's short track team, repeatedly approached him at the March 2011 championship event in Poland. "He asked me to tamper with another skater's skates," Cho says. "And I told him 'no' two times before he came to me and asked me again to do this." Documents filed in a related arbitration case allege that Chun told his team to be "obnoxious" to the Canadian skaters who shared a locker room with the Americans. Cho — along with other skaters in undisclosed documents — says Chun told them he believed the Canadian team manipulated the results in earlier races, resulting in the elimination of the U.S. team before the event's final relay. Chun says the allegations are "untrue," according to Russell Fericks, a Salt Lake City attorney who represents the embattled coach. Nineteen current and former speedskaters from the U.S. team have also filed complaints accusing Chun of physical, psychological and verbal abuse. U.S. Speedskating has placed Chun on administrative leave while an outside law firm investigates. "None of this is true," Ferick says. "And the idea of an international coach on that level instructing a skater to tamper with another skater's skates — that's nuts." But Cho says his coach was insistent. He remembers Chun saying, "If you want to be a leader for this team, if you want to carry this team to the next Olympic Games, you need to do this." That's a powerful threat, according to Rob Plum, a veteran speedskater himself and vice president of the Leading Edge Short Track Speedskating Club in Rockville, Md. "No other words would need to have been said at that point," says Plum, who knows Cho and his family well and has closely followed Cho's career and the coaching he has received. 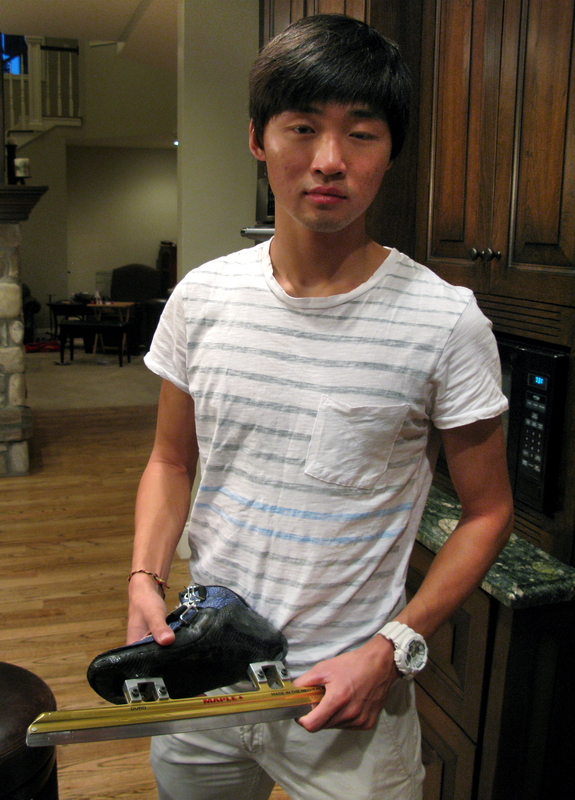 Olympic speedskater Simon Cho holds a short track skate that is similar to the one he sabotaged at an international meet last year. Cho first openly described what he did and why in an interview with NPR this week at his attorney's home outside Salt Lake City. "The coach has infinite say [over] your career," Plum adds. "In world events like the Olympics or World Cup events, we're only sending five or six skaters. You have 16 [or] 32 people vying for those spots, so if the coach is threatening to bench you, there's another person behind you waiting to come on." Cho says he took his coach's "bending machine," a device used to strategically bend a skate blade. It's meant to help the blades grip the ice just right for the 30-mph speeds and steep turns in short track racing. The locker room shared with the Canadians was empty, so Cho says he picked up the nearest skate. "It just happened to be Olivier Jean's because we just happened to be sitting next to each other" in the locker room, Cho says. "I panicked and I bent it," Cho says. "My hands were shaking because I was so terrified." Jean is one of the top skaters on the Canadian team, and he was forced out of the final relay when his skates didn't track properly on the ice. "I'd like to apologize to Speed Skating Canada, the entire Canadian team [and], of course, Olivier Jean," Cho says. "I want them to know that I have nothing but respect for them and that I'm truly sorry." Both Cho and Chun are South Korean natives. Cho entered the U.S. from Canada with his family when he was 4. He had already started speedskating before he left Korea. The Chos are American citizens now, and the family has focused on his career, following him from Maryland to the Salt Lake City suburbs where U.S. Speedskating is based and skaters train. The family left jobs and a business behind, spending as much as $30,000 a year to support Cho's training. Cho believes the fact he and Chun are Koreans made him vulnerable. "He was not only coming at me as a coach, but as a fellow Korean and as an elder," Cho says. "When an elder tells you to do something, it's very difficult to tell him no." Cho also had won the World Championship in the 500-meter event the week before the incident. "The same person that helped me win this title was asking me to do this ridiculous thing, so I was in a dark spot," Cho recalls, adding that Chun shifted from English to Korean as he pressured Cho to comply. "I was scared. I was intimidated." Ethicist Michael Josephson of the Josephson Institute in Los Angeles has conducted ethics training for Olympic athletes and says if Cho's account is accurate, he must receive significant punishment. "That is cheating of the highest order," Josephson says. "It is an incredibly serious [and] dastardly thing to do." The International Skating Union has sanctions for cheating that include suspension, banishment for life and fines. The group says it won't comment about the allegations involving Chun until U.S. Speedskating completes its investigation. "We need to take into consideration both the fact that it was his coach that ordered it and the fact that culture makes it even harder to defy it," Josephson adds. "I think the athlete should be punished seriously to send the message, but not so seriously that it ends his career." The athletes who accused Chun and other coaches of abuse demanded an arbitration hearing. They want Chun and another coach removed from the team. The arbitration is scheduled for Nov. 1. U.S. Speedskating expects to receive the investigation report by early next week at the latest. "Should the findings of the investigation warrant," the group says in a statement, "U.S. Speedskating will take immediate action to rectify any issues that may be uncovered in advance of the scheduled arbitration." Late Thursday, U.S. Speedskating announced a news conference for 3 p.m. ET Friday. Cho is holding his own news conference three hours earlier in Salt Lake City. Speed Skating Canada has declined to comment. Cho says he wants to continue skating, but he understands that some form of punishment is coming. "I hope that younger generations of athletes who hear about this are able to learn from my example," Cho says. "I want them to learn to do what they believe is right and not [yield to] the manipulation of others no matter how authoritative they may seem."